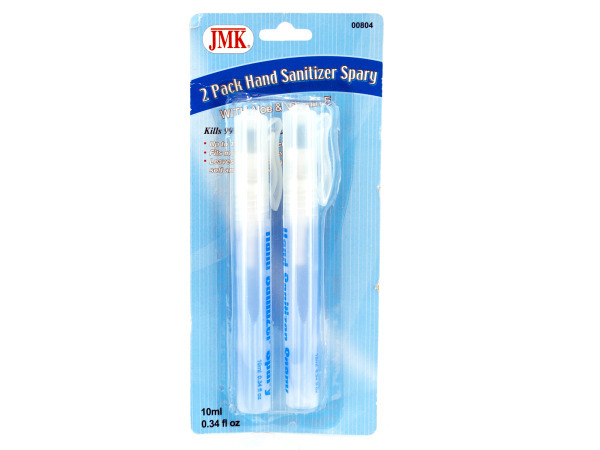 Hand sanitizers promote health by killing 99.9% of germs and bacteria. No water! No towels! Just spray the hand sanitizer into hands, rub and go. This set comes with 2 sanitizing spray bottles. Perfect size for purses, bags, office use or anyone constantly on the go. Sanitizer is unscented. Both spray bottles are packaged on a blister card with hanging hole. Antibacterial spray bottles are .34 fluid ounces each.